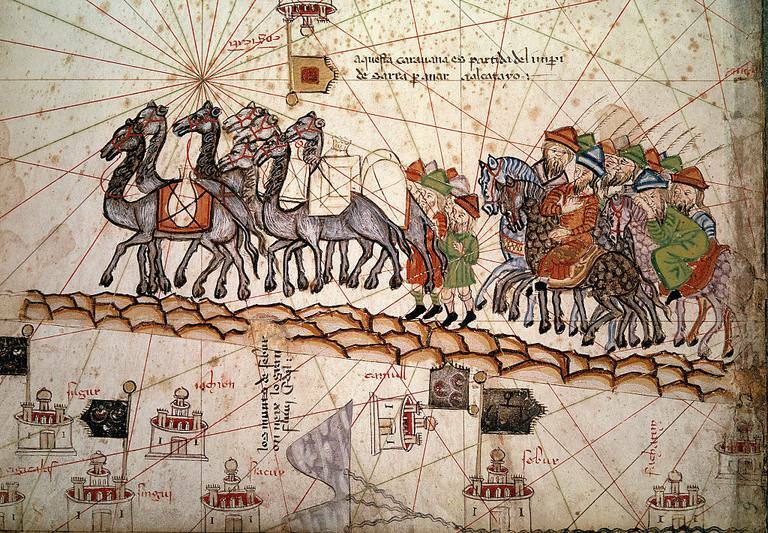 The Silk Road (or Silk Route) is one of the oldest routes of international trade in the world. First called the Silk Road in the 19th century, the 4,500-kilometer (2,800 miles) route is actually a web of caravan tracks which actively funneled trade goods between Chang'an (now the present-day city of Xi'an), China in the East and Rome, Italy in the West at least between the 2nd century BC up until the 15th century AD. The Silk Road is first reported to have been used during the Han Dynasty (206 BC-220 AD) in China, but recent archaeological evidence including the domestication history of a series of animals and plants, such as barley, indicates that trade managed by the ancient steppe societies across the central Asian deserts began at least 5,000-6,000 years ago. Using a series of way stations and oases, the Silk Road spanned the 1,900 kilometers (1,200 miles) of the Gobi Desert of Mongolia and the mountainous Pamirs (the 'Roof of the World') of Tajikistan and Kyrgyzstan. Important stops on the Silk Road included Kashgar, Turfan, Samarkand, Dunhuang, and the Merv Oasis. The Silk Road contained three major routes leading westward from Chang'an, with perhaps hundreds of smaller ways and byways. The northern route ran westward from China to the Black Sea; the central to Persia and the Mediterranean Sea; and the southern to the regions which now include Afghanistan, Iran, and India. Its fabled travelers included Marco Polo, Genghis Khan, and Kublai Khan. The Great Wall of China was built (in part) to protect its route from bandits. Historical tradition reports that the trade routes began in the 2nd century BC as the result of the efforts of Emperor Wudi of the Han Dynasty. Wudi commissioned Chinese military commander Zhang Qian to seek a military alliance with his Persian neighbors to the west. He found his way to Rome, called Li-Jian in documents of the time. One extremely important trade item was silk, manufactured in China and treasured in Rome. The process by which silk is made, which involves silkworm caterpillars fed on mulberry leaves, was kept secret from the west until the 6th century AD when a Christian monk smuggled caterpillar eggs out of China. While important to keeping the trade connection open, silk was only one of many items passing across the Silk Road's network. Precious ivory and gold, food items such as pomegranates, safflowers, and carrots went east out of Rome to the west; from the east came jade, furs, ceramics, and manufactured objects of bronze, iron, and lacquer. Animals such as horses, sheep, elephants, peacocks, and camels made the trip, and, perhaps most importantly, agricultural and metallurgical technologies, information, and religion were brought with the travelers. Recent studies have been conducted at key locations along the Silk Route at the Han Dynasty sites of Chang'an, Yingpan, and Loulan, where imported goods indicate that these were important cosmopolitan cities. A cemetery in Loulan, dated to the first century AD, contained burials of individuals from Siberia, India, Afghanistan, and the Mediterranean Sea. Investigations at the Xuanquan Station Site of Gansu Province in China suggest that there was a postal service along the Silk Road during the Han Dynasty. A growing mass of archaeological evidence suggests that the Silk Road may have been in use long before Zhang Qian's diplomatic journey. Silk has been found in the mummies of Egypt around 1000 BC, German graves dated to 700 BC, and 5th century Greek tombs. European, Persian and Central Asian goods have been found in the Japanese capital city of Nara. Whether these hints ultimately prove to be solid evidence of early international trading or not, the web of tracks called the Silk Road will remain a symbol of the lengths to which people will go to stay in touch. Christian D. 2000. Silk roads or steppe roads? 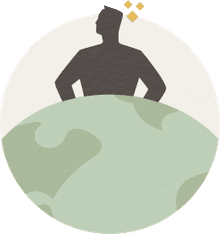 The Silk Roads in world history. Journal of World History 11(1):1-26. Dani AH. 2002. Significance of Silk Road to human civilization: Its cultural dimension. Journal of Asian Civilizations 25(1):72-79. Fang J-N, Yu B-S, Chen C-H, Wang DT-Y, and Tan L-P. 2011. Sino-Kharosthi and Sino-Brahmi coins from the silk road of western China identified with stylistic and mineralogical evidence. Geoarchaeology 26(2):245-268. Hashemi S, Talebian MH, and Taleqni EM. 2012. Determining the Position of Ahovan Caravansary in Silk Road Route. Journal of Basic and Applied Scientific Research 2(2):1479-1489. Liu S, Li QH, Gan F, Zhang P, and Lankton JW. 2012. Silk Road glass in Xinjiang, China: chemical compositional analysis and interpretation using a high-resolution portable XRF spectrometer. Journal of Archaeological Science 39(7):2128-2142. Toniolo L, D'Amato A, Saccenti R, Gulotta D, and Righetti PG. 2012. The Silk Road, Marco Polo, a bible and its proteome: A detective story. Journal of Proteomics 75(11):3365-3373. Wang S, and Zhao X. 2013. Re-evaluating the Silk Road's Qinghai Route using dendrochronology. Dendrochronologia 31(1):34-40.